For decades, Pyware 3D has provided a premier visual experience to preview your show – we’ve taken it to another level. We are now introducing the option to customize your uniforms, equipment, surfaces, and props for an even more realistic preview. Marching bands can see each aspect of their show before stepping foot on the field. Visit our Real View Store and find a space to upload a file or picture of what you’d like our design team to create! When submitting the item(s) to customize, our Art Director Jesse Mercer, requests as much detail and reference in order to create the best replica. Imagine eliminating the guesswork while arranging a show – we are providing band directors the opportunity to view every facet of the completed work. 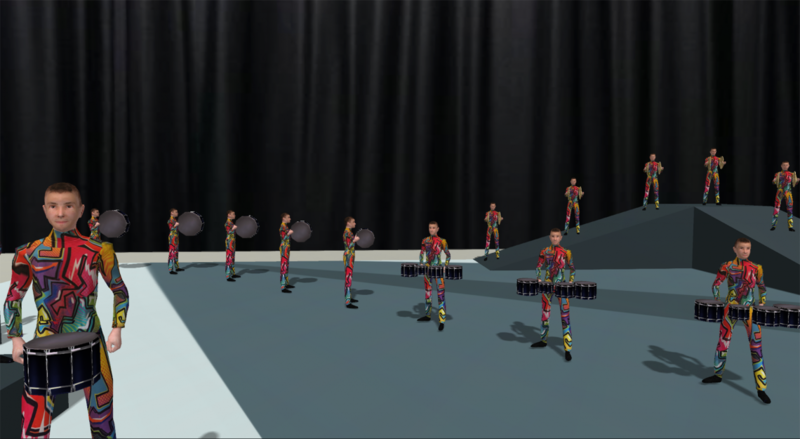 “With the incredible interactive features Pyware brings to the table, adding marchers and props give us the unique ability to bring marching simulation closer to life than anyone else in our field,” Jesse states. The expertise and quality of work within our art department coupled with that of our program designers multiplies the value of our product. Utilizing an array of different tools such as Blender, Zbrush, Photoshop and Substance Painter, our artwork provides a lifelike preview experience, boosting the confidence of the director and athletes before showtime. Allow a world-class interface paired with custom-made art to simulate all the intricacies of your show and and take your visual experience to the next level. Check out our Real View Store go get started!